World Cup fever has set in at Vanilla Frost HQ. My son’s first words when he opened his eyes this morning were “Only two days until the World Cup starts!”. The wall chart is up, the Panini sticker albums are starting to look full and we are all getting excited. So it was lovely to have a World Cup themed cake commission last week. 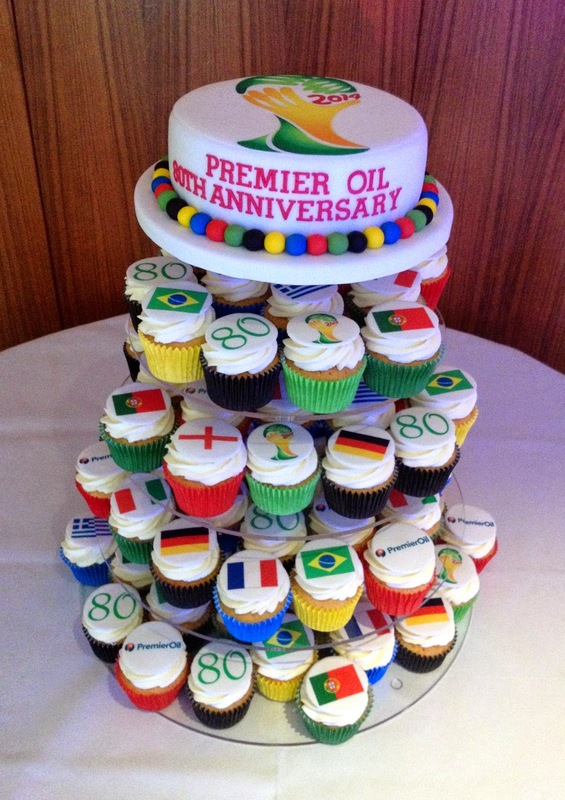 Premier Oil celebrated their 80th anniversary with a fabulous party at Kensington Roof Gardens. There were Brazilian singers and dancers, flags, footballs and fantastic food (and a couple of flamingoes!). I made this tower of cake and cupcakes, featuring flags from some of the competing nations.